Poroshenko views Zelenskyy's remarks on Donbas "rebels"
Russia-backed terrorists active on all fronts. 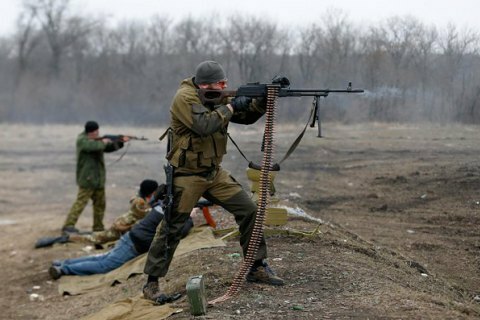 Over the past day, Donbas militants 37 times fired at the positions of Ukrainian troops in the zone of the antiterrorist operation in Donbass, the ATO press center reported on Facebook 17 November. The terrorists have been active on all fronts. In the Mariupol sector in the areas of Borodyno and Shyrokyno - they used 152-mm artillery on two occasions. Hnutove, Mariyinka, Vodyane, Shyrokyno, Novotroyitske and Pavlopil wer shelled from mortars of various calibers. Novotroyitske, Pavlopil and Mariyinka were also under sniper fire. The enemy attacks in the Mariupol sector totalled 24 counts. In the Luhansk direction, Novozvanivka was repeatedly shelled from mortars, while in the areas of Syze, Shariv, Kut and Novooleksandrivka was under fire of smaller calibre weapons. Outside Donetsk, the terrorists fired on Novhorodske, Avdiyivka and Luhanske. In Maryinka, private homes and a school were reportedly damaged in the enemy shelling. Will Palestine become a new member of the UN? And can Russia really verify its membership of the United Nations? Russia seeks to increase the leverage in Ukraine regardless of the next president. What is behind Jerusalem's sensitive response to Ukraine barring a group of Israelis from entering? Send Oops, not an error!